Environmental rules, like any regulation, upend industries and business behavior in obscure ways. Ultimately, however, like a tax they usually leave consumers on the hook for the costs. I know because I'm one of them. Why it matters to most of you: Nearly 90% of U.S. homes have air conditioners. If a technician encourages you to replace your A/C because of environmental rules, don't take the bait without first getting a second (and maybe a third) opinion. Refrigerant 101: Refrigerants enable air conditioners to keep homes cool. There's three kinds to know that regulations are affecting. Most air conditioners installed before 2010 use refrigerants that deplete the Earth's ozone layer. In industry talk, it's called Freon R22. 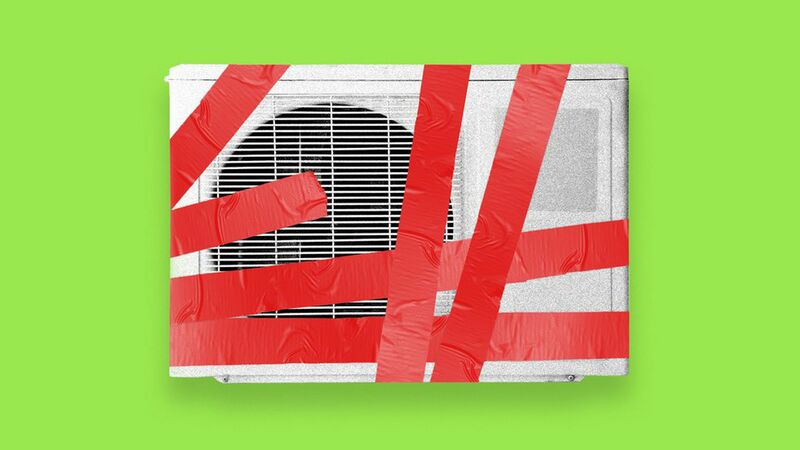 Most newer air conditioners use refrigerants that don't hurt the ozone layer but do contribute to climate change because they emit greenhouse gases. The air-conditioning industry is researching refrigerants that are friendly to both the ozone layer and climate change, which could be on the market in the next few years. The drawback: They're mildly flammable. Responding to the Montreal Protocol, a 1987 global treaty protecting the ozone layer, air-conditioning companies have been working to transition away from equipment with the ozone-depleting refrigerants. The hole in the Earth's ozone layer is on the mend thanks to that treaty. Climate change is now the world's top environmental worry. Political leaders came together last October to begin transitioning away from refrigerants that emit greenhouse gases and toward the third kind that are safe for both the ozone layer and climate change. "We didn't anticipate having to go through a transition again as quickly as we have," said Francis Dietz, a vice president at The Air-Conditioning, Heating, and Refrigeration Institute, an industry trade group representing manufacturers like Honeywell and Chemours. "At the time, we were not thinking about climate change all. That was not the issue. The issue was ozone depletion." The manufacturing industry is working to change building codes to allow new air conditioners with the mildly flammable refrigerants. That's prompting alarm among a separate set of companies that install the equipment. "We have been concerned for contractor and consumer safety with the risk of slightly flammable refrigerants leaking into people's homes," said Don Prather, technical services manager with the Air Conditioning Contractors of America, a trade group. "We recognize there are so many contractors out there doing a poor job of installing the equipment, which creates an opportunity for more leaks." Dietz and other industry officials stress that mildly flammable appliances already exist in people's homes, like natural gas-fired stoves, and extensive testing is being done to ensure safety. "We are doing our due diligence," Dietz said. "Nobody has the slightest interest in anything happening at somebody's house as a result of being more environmentally friendly. That's not a tradeoff we're interested in." The EPA set a 2020 deadline to phase out R22, the ozone-depleting refrigerants. That has led some contractors, squeezed by high prices of the outgoing refrigerant, to encourage consumers to prematurely buy new air conditioners with the ozone-friendly refrigerant, which itself is set to be nearly phased out in the U.S. within 20 years. During a routine maintenance call recently, a technician said my A/C unit was low on refrigerant and recommended I replace it, citing the EPA ban. Getting a new A/C with the ozone-friendly refrigerant would cost about $8,000 because my unit does heating and cooling, according to the company, United Air Temp. Founded in 1931, the company works with more than 100,000 homes in the greater Washington, D.C., area and other nearby states. "If your heat pump or air conditioner is using Freon R22 and you need service, there is a good chance it may not be available," states an invoice I received after the technician's visit. Describing that as "extremely misleading," Dietz said that even though R22 prices are going up due to restricted supply, it will remain available to consumers for the foreseeable future. "We all feel badly when we have situations like this with contractors because it takes advantage of consumers' understandable lack of knowledge about these things and gives the industry a bad image that we try very hard to avoid," Dietz said. Francis McGonegal, senior vice president with United Air Temp, said their technicians are trained to "not focus on having people replace equipment unnecessarily." Because of the EPA ban, the company's costs to buy R22 have become "exorbitant," McGonegal added. Multiple industry officials and technicians I talked to said my experience is not too uncommon because of consumers' lack of understanding and the high costs of the refrigerant. Industry officials say consumers don't need to worry yet about transitioning to the third type of refrigerants. The process is long and shouldn't require people to prematurely replace their equipment. A lawsuit and uncertainty with the Trump administration's position on the policy could further slow the transition, but experts agree it's a matter of when, not if. Even environmentalists pushing for the transition to the third type don't support premature air conditioner replacements. "If the problem is you need more refrigerant, the best thing to do is get it recycled from someone else's machine," said David Doniger, who directs the Natural Resources Defense Council's climate and clean air program. "I think it's very important to check whether you really need a replacement." As for me, I got two more technician opinions and a leak test that cost $150. It came back negative. I refilled my 10-year-old system, which could last at least another five years, with ozone-depleting refrigerants at a cost of $187.50. I'll get another A/C checkup within the next year, to make sure it's not leaking.